Poptropica Members have full access to the newest Poptropica adventure. Non-Members can also try out the special Early Access demo. Head on over to Poptropica and see what the big deal is! We can't wait to let Poptropicans start playing Shrink Ray Island tomorrow. But there's one drawback: you only have one more day to try to beat Shark Boy's high score in Shrink Shot! Can you do it? Find out before Shrink Ray Island opens tomorrow, June 30! It's true: Poptropica: The Official Guide is coming! 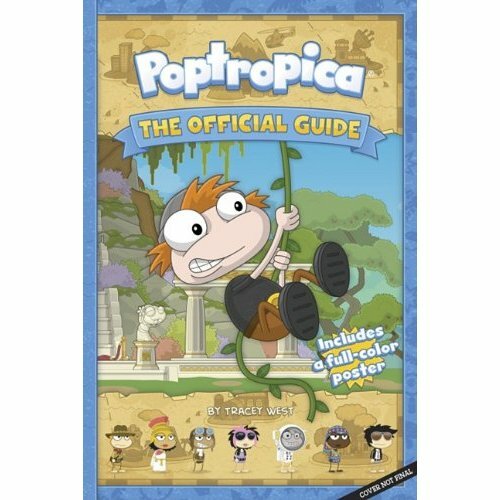 This full-color guidebook contains walkthroughs for most Poptropica Islands, behind-the-scenes looks at how an Island is made, and quotes from the Poptropica Creators. Poptropica: The Official Guide will be released on October 13. For a special sneak preview, visit the Poptropica guidebook page on Amazon.com for a special preview: an interview with Jeff Kinney, Poptropica creator and Diary of a Wimpy Kid author! Shrink Ray Island is coming this Thursday, June 30. Here's your first look at the Shrink Ray Island map. You'll explore much of Shrink Ray Island as a teeny tiny Poptropican. Good thing we didn't shrink the map, too! This is it. To celebrate the launch of our 20th Island, Shrink Ray Island, today we conclude our list of the 20 rarest items in Poptropica history. 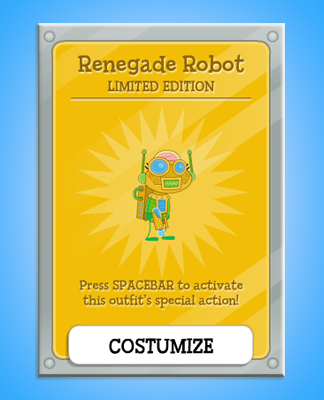 This dazzling costume was available for a short time by clicking on an otherwise unremarkable window in Early Poptropica. One of the hardest items to acquire in Poptropica's history was the Nessie Hat during the sneak preview of Cryptids Island. Players could look through a viewfinder on the shores of Loch Ness, and those who spotted Nessie won this item! Unlike the Loch Ness viewfinder, roping cattle in the Wild West sneak preview wasn't about luck. But it was incredibly difficult, and not many Poptropicans were able to wrangle all of the prizes from that game, including the final prize, Wunder Bubble Tonic. To win the 3rd birthday hat, a Poptropican had to be incredibly lucky. First of all, you had to be in a common room during our 3rd birthday celebration last September. Next, you needed to see a special balloon appear, which most Poptropicans never did. And finally, you had to click on the balloon before you left the room! Those who made it were rewarded with the 3rd birthday hat, the rarest item in the history of Poptropica. If you missed any of these rare items over the past 20 Poptropica Islands, never fear: there will be a lot more costumes and powers to come from the next 20 Islands -- and beyond! We're continuing our countdown of the 20 rarest items in Poptropica. This special item was available to Poptropica Members during the launch of Great Pumpkin Island. Snoopy's pal, Woodstock, will follow you around anywhere you go! 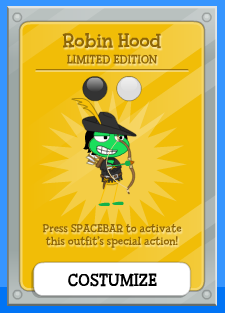 You can still find the standard-issue Robin Hood costume in the Poptropica store, but this limited edition was available for only a short time back in 2009. Like the limited edition Robin Hood costume, the Renegade Robot was available in the Poptropica Store for one short week back in August of 2009. 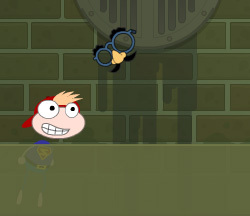 The most sought-after costume from those heady days of summer 2009, the Light Ninja lives on in the hearts and minds of Poptropicans everywhere. Tomorrow: the 4 rarest Poptropica items! We're continuing our countdown of the 20 rarest Poptropica items. 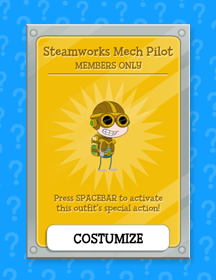 For a limited time, Poptropica Members were given this Mech Pilot costume. 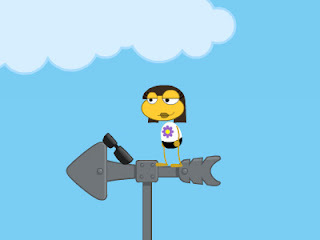 Anyone can freely costume similar costume parts on Poptropica, but this specific costume is a rare one indeed. Another challenging Island, Skullduggery has seen fewer completions than most of the other Poptropica adventures. It's not too hard, though -- just keep working your way clockwise from one trading post to the next, and in no time you'll have enough doubloons to buy the Phoenix Warbird! To celebrate the release of our Diary of a Wimpy Kid-themed Island, Wimpy Wonderland, all Poptropica Members got the "Paper Kid" costume. Unlike most costume cards, this one doubled as a special power. You can paperize anyone else you see, too! At last, I have discovered the identity of the counterfeit Dr. Hare. Unfortunately, the truth is worse than I had feared. Anyone who gets the Dr. Hare 6" figure will also receive a secret code that will allow them to costumize Dr. Hare for the first time ever. That means that anyone could be disguised as Dr. Hare! 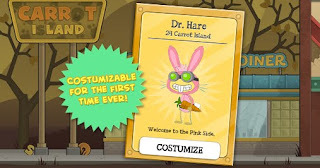 There will be Dr. Hares all over Poptropica! Oh, this won't do. This won't do at all. To celebrate the launch of our 20th Island, Shrink Ray Island, we're counting down the 20 rarest items in Poptropica history. Astro-Knights is one of the toughest Islands we've made, so it's no surprise that not many Poptropicans have this medallion in their inventory. But it's not out of reach! All you need is a little perseverance. Another treasure hunt item, the goofy glasses were briefly available in the sewers of Super Power Island. But if you missed out then, you can still get them in the eyeglasses shop on Spy Island! All Poptropica Members who played the cattle-rustlin' preview game for Wild West Island were granted this exclusive Wild West Hero outfit. But this wasn't even the most rare item from that game! The sunglasses were briefly available on top of Pendulum's lab on Time Tangled Island. The dark glasses will return, however! Players who get the Spy Island 3" action figures will receive a code that will allow them to wear a Spy Agent costume that includes these killer shades. I have the highest Shrink Shot score of any of the Poptropica Creators, and the video to prove it! What's your high score? Head over to Poptropica and play Shrink Shot now -- if you think you can beat me! Good news, everyone: Shrink Ray Island launches on June 30! It's hard to believe, but Shrink Ray Island will be the 20th Poptropica Island. That's a lot of adventures -- lots of characters to meet, foes to battle, and items to collect. In the time since we introduced Early Poptropica, some items have been harder to find than others. To celebrate our 20th Island, we'll be counting down the 20 rarest items in Poptropica. How many of these rare items do you have in your inventory? The cell phone on Nabooti Island holds many secrets. If you dial 411 and then make a call, you'll find yourself with all the information you could ever need! The Viking Suit is tucked away in the upper righthand corner of the Viking time period on Time Tangled Island. 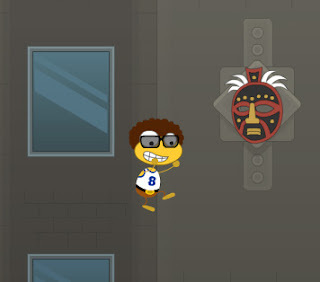 It's not necessary to complete the quest, so some Poptropicans missed it. To get the Viking Suit, equip the glider from Leonardo's workshop, and then glide from the Viking mountain until you land on the ledge with the suit. It's the priciest item in the Poptropica Store, but the most versatile. With the Multiverse, you can create your own room and invite your real-life friends to chat and battle. To celebrate the launch of Nabooti Island, we hid this mask somewhere on Spy Island for a short period of time. This isn't the only treasure hunt item that will show up on this countdown! Tomorrow, we'll count down the next four items! Comics are up and running in the Daily Pop. 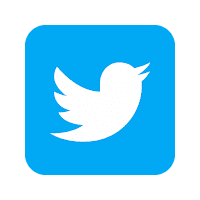 Thanks for your patience!